…I need more practice. But I promised myself better trees/leaves by fall’s end, so … I do find I enjoy painting both leaves and trees, so it’s all good! Neocolors and Cotman travel palette and a very looooong football game assisted in this artwork. Probably best to paint in the sky before the tree is painted. Although this one kinda looks like a tree in the rain, which all of the trees are at this point, so. Onward! I hope you take some time to savor the smells of fall today. Cinnamon alone is just….it really is enough. But add nutmeg and a Granny Smith apple and do you really need another thing? Exactly. Peace. < Day 11: Leaf Challenge? or Drunken Artist? Lovely tree and beautiful colors. Peace. Thanks, C! They need lots of work but I shall press on! Very pretty…and what is it that those leaves are whispering? Could it be, “Happy Birthday to you!” Seriously, if I remember right, today is your birthday – may it be blessed in every way that makes you smile! The 11th. 🙂 And if all goes as planned, I’ll spend the weekend hiking and taking pictures with my daughter on her college campus. It’s your BIRTHDAY??!!! Happy Happy Happy!!! Thanks for the reveal Kathy! 🙂 hehe! This is a beautiful tree, and it does look like it is raining, which is exactly what it looks like here today! Except the leaves aren’t nearly as beautiful yet! Yes – it is a cinnamony, appley, wonderful birthday day for Ms. Autumn! Hugs! Thanks, Jodi! Our trees aren’t either, they are mostly green still, I was drawing this from my imagination. Trees are hard enough from my mind, let alone trying to draw actual trees but I’m on a mission to improve them! Happy autumn weekend and give Janet a big hug! Mine is December 31st – New Year’s Eve! I’ll be (gulp!) 53 this year. You’re way younger in spirit – age is just a number! Happy Birthday Laura!!! Your tree is lovely. I wish we had more trees with red, and orange in them. Most of our tree’s foliage turns yellow or straight to brown. It does look like there’s rain on the trees! It’s a lovely fall tree, too! And is it really your birthday? 🙂 If so, hope you’re having a delightful day! First Happy Birthday!!! Your love of nature shows through in all your drawings. 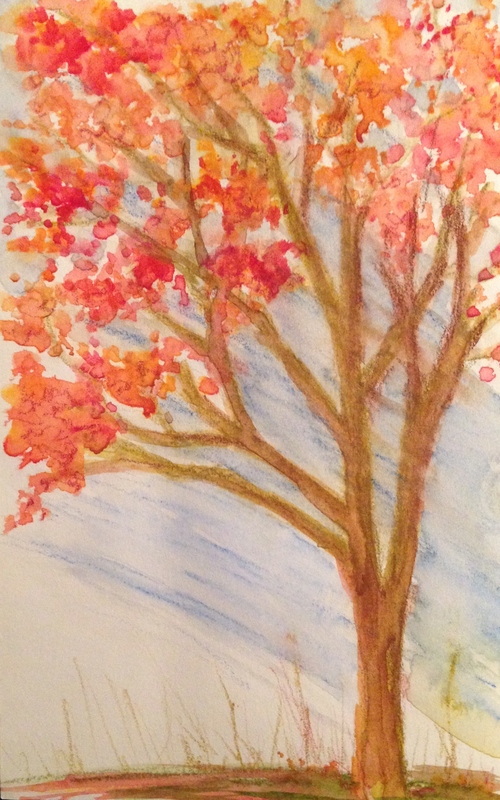 This is the season for tree drawing. You have captured that feeling of fall! Thanks, Ann – I def. need to try this! Trees look very weird with painted-in sky in between the branches, lol. Nice! I like how you work backwards. Ha Add a big scoop of vanilla ice cream to the cinnamon – nutmeg apple and I’m right there with you. Enjoy your weekend! I love the warmth the fall foliage colors brings to the otherwise cold autumn days. My personal favorite time of the year, great job capturing that feeling! Hope you enjoy your day to the fullest. Just toodling along on my reader as I usually do, admiring your tree…and I discover it’s your birthday….Happy, happy! Happy Belated Birthday Laura! Hope it was a good one. A fellow Libra! Keep painting those trees, very nice. Thanks! Happy Birthday to you too! We really don’t get much Fall here in Texas. I do miss those colorful trees and crisp walks in the woods! I love drawing trees too! But I’m looking forward to the winter as I love the patterns of the branches against the sky. Thanks so much, Jean – I agree with you; I think winter will be really fun this year, sketching trees bare of leaves.